At Kibbutz Ein Gev, on the eastern shore of the Sea of Galilee, we had nice rooms with patios looking out on the water, and good food. Ellen started us off with a reading of Psalm 24. Then, as we drove north, Ellen described the importance of the Golan Heights to Israel and the significance of the old 1949 border line that divided Israel from Syria. The 1949 line gave Israel a 10 meter strip of land from the water's edge on the east side of the Sea of Galilee. This left Israel with the sole water rights to the Galilee. One third of the fresh water in Israel is pumped out of the Galilee (350 feet below Sea level) into huge reservoirs from where it is distributed by gravity to much of the nation. We saw many coneys (rock badgers or hydrox) along the rocky landscape as we drove north to Bethsaida (which means the house of fishermen). Bethsaida, the original home of apostles Peter, Andrew and Phillip, is located on a low hill far from any open water. Alluvial deposits from the Jordan River have filled in the area that once was open water. It is possible that disciples James and John were also from Bethsaida. We saw a wine cellar house and flour grinding stones. We saw a small replica house that had the lower half of its walls made of stone and upper half made of mud bricks. We also saw the Iron Age city gate (1,000 B.C.) with paved roadway approach, Bema (high place), water trough, standing stone and 4 gate rooms. As we continued on to Tel Hazor, Ellen told us about the famous Israeli spy, Eli Cohen who convinced the Syrians plant Eucalyptus trees at their Army installations to shade their men. This later allowed the Israeli military to target the Syrian installations in the Golan Heights. Hazor is the largest Tel in Israel and contains an upper and lower city. It was the largest Canaanite city that Joshua conquered. Cuneiform tablets found in Egypt and Mesopotamia indicate trade with Hazor. 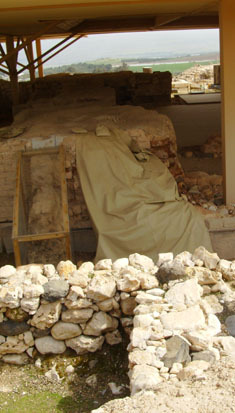 Archaeologists are looking for a similar archive of documents at Hazor. A Solomonic gate with 6 rooms was partially excavated. Multiple levels of cities were visible. In one area we could clearly see 4 levels of occupation. The water system was similar to the one we saw at Megiddo with several hundred feet of stairs spiraling down to a pool at the water table. We saw a four-room Jewish house built on top of an earlier Canaanite house. 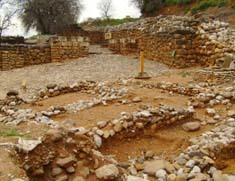 The remains of an Israelite tripartite building were excavated that had been used either as a storehouse or stable. 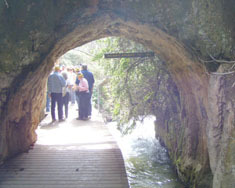 Then on north to Banias, also known as Caesarea Philippi during Jesus' time. A large cave in the cliff face is where Pan had been worshipped and where the spring that formed the large, fast moving stream used to issue forth. The Banias stream is a tributary to the Jordan and carries 25% of the Jordan's flow. We saw trout in the clear waters of the stream. We crossed under an ancient Roman bridge and saw an ancient grist mill still in operation by an old Druze man and his family. Nearby were the ruins of the palace of Agrippa II. There were curved towers at the gate, many archways, and a water system that diverted water from the stream beneath the palace. There was a mosque built on the top of a synagogue that was built on top of part of the palace. We saw a cardo (colonnaded walkway adjacent to a roadway) with many broken columns reused from earlier construction in the stone walls. After lunch we continued on to Tel Dan. The Dan River is also tributary to the Jordan and contributes 50% of the Jordan's flow. Keith Schoville spent several seasons excavating this site. We saw the remains of the cultic high place built by Jeroboam for worship. The north base of the Tel used to be the Syrian Border and we could see trenches, gun emplacements and the remains of a burned out armored vehicle. The old city had massive earthen ramparts around it with a 3-arch gate from around the time of Abraham (circa 2,000 B.C.) being excavated and restored. The 3-arch gate is facing the ancient road to Damascus. 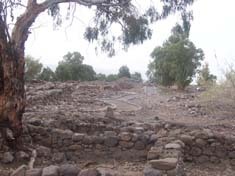 On the south side of the Tel was a later stone wall that jogged in and out with a typical Israelite Iron Age gate with rooms and an open courtyard area featuring stone benches along the walls. From Dan we returned to Kibbutz Ein Gev for dinner and the night.